A long-awaited sequel to the award-winning Shhh! Can you get through the book without coming face-to-face with a scary bear? What will you do if you see one? Why shut the book of course! 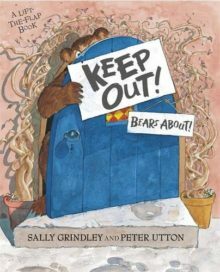 Based on Goldilocks and The Three Bears, Keep Out! physically involves the reader in the narrative and adventure. Young children can lift the flaps as they follow the adventure.